GG-EDT provides quality, considerate dental healthcare for your horses and ponies. Utilising patience and excellent handling abilities, the majority of patients can receive routine work, without sedation or power tools, which we consider better for your animals, and of course reduces the cost burden to you. Please use the links at the top of the page to find out more about GG-EDT's ethos and methods of working, to find out whether GG-EDT will come to your area, or to find out the current price list. If you have any questions or concerns at all, do not hesitate to call using the number below, or drop us a message using the email address below. You can also find Gary on Facebook by clicking the Facebook status box above and send him a PM there. © 2007-2018 Gary Wilson / GG-EDT All rights reserved. 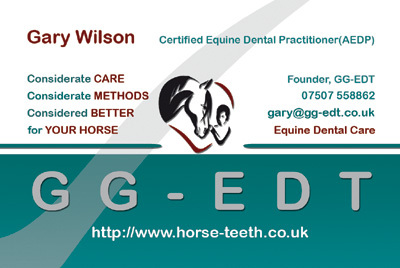 GG-EDT, the "horse heart" device and associated names and logos are TM Gary Wilson.